We are garage floor epoxy coating specialists. Systems range from basic colors to decorative chip systems and metallic decorative epoxy. 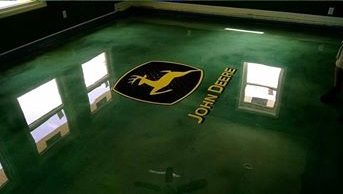 Garage floor epoxy coatings are one of our specialties. We provide a turnkey solution starting with crack repair and shot blasting to prepare the coating – the preferred method of all epoxy coating manufacturers. In the attempts to save time, many other companies will use acid washing for substrate preparation, but this is one of the least effective methods of preparing the surface. In fact, it often leads to coating failure. 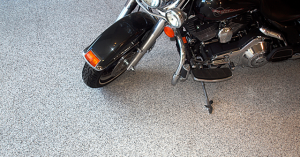 We offer three main systems for garage floors. The HERMETIC system by Elite Crete Systems is designed for warehouse, manufacturing and industrial systems. 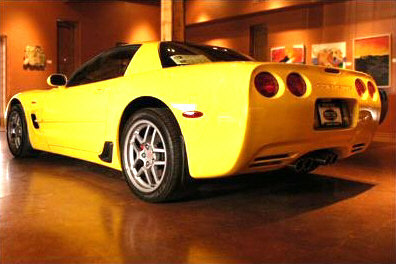 It provides a low maintenance, non-skid finish that has been proven for long-term durability. The cost of a HERMETIC garage floor starts at $2,995 for a two car garage up to 600 square feet. Add a custom logo starting at $500. 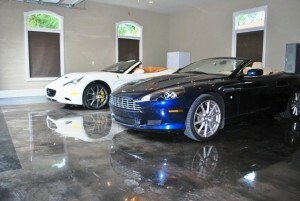 The cost of the Epoxy Color Flake Floor System starts at $3,995 for a two car garage up to 600 square feet. You can customize your floor with your logo starting at $500. The cost of the REFLECTOR Enhancer Flooring System starts at $4,995 for a two car garage up to 600 square feet. Customization with your logo is also possible with this option, beginning at $500. We are based in Tiverton RI and serve customers throughout the local areas including Providence, Boston, Cape Cod and Fall River areas.